Backpacking meal suggestions come in handy when preparing for a camping adventure. Whether you are going backpacking for one night or several days, planning for meals during an outdoor adventure can be challenging. 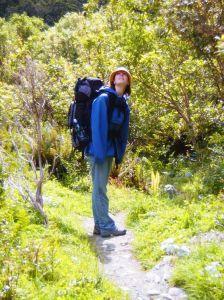 Both space and weight are important considerations when preparing for a backpacking trip. Taking too much food, or any other supplies, can make your pack unnecessarily heavy. However, not taking enough food can be just as much of a problem. You can't just stop and buy a burger in the middle of the wilderness if you run low on food, so it's essential to plan meals and snacks ahead of time. Take food that is nutrient rich. Foods that lack nutritional value are just empty calories. They won't give you the energy you will need when backpacking, but they will take up a lot of room in your pack. Be sure to take foods that are easy to prepare. If you are taking food that requires cookware, take the non-stick variety for easy cleaning. Taking messy foods on a camping trip is ill-advised. If it is warm, do not carry foods that are likely to melt or that are easily perishable. Organize your food items and group meals together while you are packing. It is a good idea to organize meals together in zip lock bags. This will keep you from having to rummage through or empty your backpack every time you need nourishment. Select self-contained food items as much as possible. Get rid of any unnecessary packaging materials. It's senseless to carry around trash when space is at such a premium. It is also wise to avoid taking glass containers because they pose a safety hazard. Many foods that you already keep in your pantry can also work very well for backpacking. The key is to carefully select foods that transport well, require little or no preparation time, and provide a lot of nutritional value. You can also purchase food items designed specifically for backpacking. The best beverages are ones that provide hydration and can be prepared quickly and easily. Good beverage choices for backpacking include: tea, coffee, instant powdered beverages and Gatorade (or other sports drinks). If you aren't likely to be in an area with potable water, be sure to take a water purifier. Foods like instant oatmeal and instant grits work well for backpacking trips. Bagels or bread with peanut butter and jelly are also popular breakfast items. Be sure not to select peanut butter or jelly in glass jars, and make sure they are stored in leak proof containers. Single serving tubs work very well. Breakfast bars that contain more protein and other nutrients than sugar are also excellent backpacking breakfasts. When selecting snacks, it is a good idea to focus on sources of protein and complex carbohydrates. Dried fruit and nuts are excellent choices, whether eaten alone or in a trail mix or gorp mixture. Chocolate covered peanuts or other nuts are acceptable for candy lovers, unless it is so hot that the candy will melt and make a sticky mess. Beef jerky and protein bars are also good choices for backpackers. 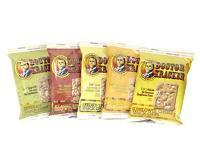 For crunchy snacking, Dr. Kracker whole grain crackers and snack chips are a nutritious option. Popular backpacking meal suggestions for lunch and dinner include: Ramen noodles, dried soups, macaroni and cheese, pita bread and sliced pepperoni. Instead of raiding your pantry before your next backpacking trip, you might want to purchase a selection of freeze-dried meals or snacks made especially for backcountry camping and hiking. Dehydrated and freeze-dried foods are perfect for backpackers, because they are lightweight and do not require refrigeration. Mountain House carries more than 50 different freeze dried backpacking meal selections, including beef stroganoff, lasagna, beef stew, bacon and eggs, chicken teriyaki, and many other items. Wilderness Dining's inventory includes a number of different entrees featuring many kinds of meats and vegetables. They also carry meatless and gluten-free entrees. Snack selections even include several flavors of freeze-dried ice cream and ice cream sandwiches. When getting prepared for your next backpacking trip, remember to select foods that pack well, aren't messy, are non-perishable and are nutritious. With just a little advance preparation, you'll be dining in style in the great outdoors.